The Chicago Cubs return to Wrigley Field after playing a makeup game against the Washington Nationals on Thursday afternoon. 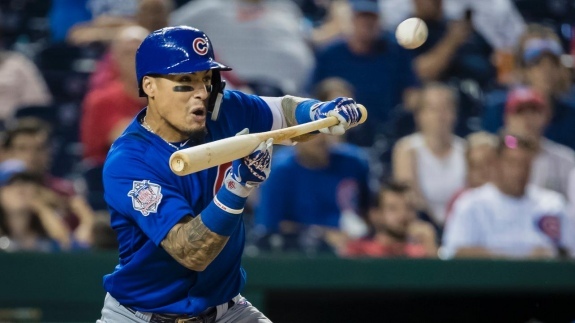 Javier Baez knocked in the game-winning run with a bunt single in the 10th inning. Tonight, I'll make my final trek to Wrigley Field during the 2018 regular season to watch the Chicago Cubs (85-61, .582) play the Cincinnati Reds (63-84, .429). The two teams serve as bookends in the National League Central with the Cubs sitting in first place with a slim 1 1/2 game lead over the Milwaukee Brewers (84-63, .571) and the Reds in last place. Cincinnati will send 29-year-old Matt Harvey (7-8, 4.87 ERA) to the mound. During his last start, Harvey pitched six innings, fanned 10 San Diego Padres (59-88, .401) and earned the win. I was in attendance at Wrigley Field for Harvey's start against the Cubs on August 24. He walked away with a no-decision, but allowed only one earned run in 5 1/3 innings. Since being traded from the Texas Rangers (62-84, .425) to the Cubs, Cole Hamels (9-9, 3.71 ERA) has served as the team's ace. Tonight, the Cubs will start the 34-year-old lefty against Harvey. I was in attendance on August 28 when he pitched five scoreless innings against the New York Mets (68-78, .466). While I attend many games each season, this year was unusual because of seeing several matchups between the same teams. Today will mark the second time this season seeing the Reds and Cubs play at Wrigley Field. The Cubs and Brewers faced each other twice. Once was in Milwaukee, the other was on Wednesday at Wrigley Field. I've seen the Pirates and Brewers play at Miller Park twice. The Chicago White Sox hosted the Kansas City Royals and Cleveland Indians at Guaranteed Rate Field twice.